I first shared this recipe on The Recipe Critic where I am a contributor. 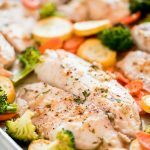 Get a healthy dinner on the table in less than 30 minutes with this easy Sheet Pan Baked Tilapia. This recipe is also great for meal prep! PIN TO YOUR DINNER RECIPES BOARD TO SAVE IT! 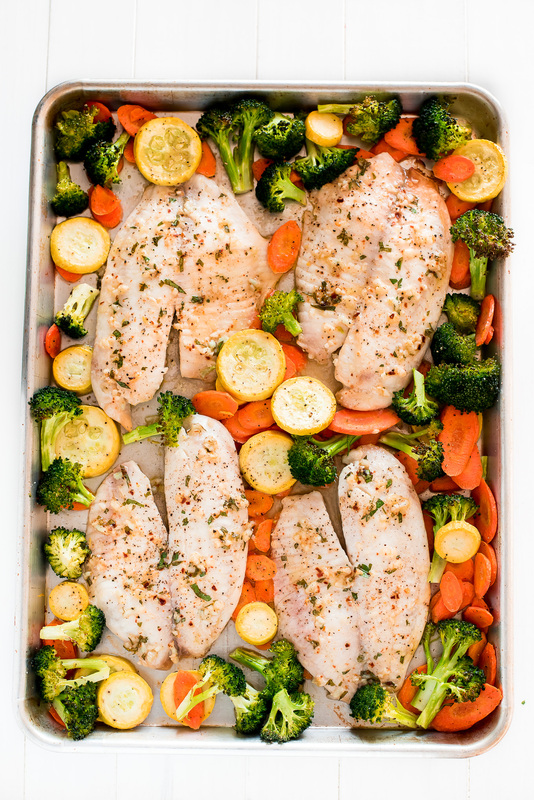 I’m always trying to eat more vegetables and this Sheet Pan Baked Tilapia with Roasted Vegetables is a great lean and healthy way to do it. This meal is so easy to make and comes together quickly which is especially nice because who has time to slave away in the kitchen for hours these days? With three little ones at home I know I sure don’t. There is also little time for me to squeeze in workouts so keeping my meals low calorie with lean proteins like tilapia is a necessity. I’m not a huge fan of snacking on raw veggies but I live for roasted vegetables. There’s just something about the roasting process that makes vegetables so delicious. Have you tried roasted green beans or roasted cauliflower? So good! First, chop up all of the veggies and spread them on a baking sheet. 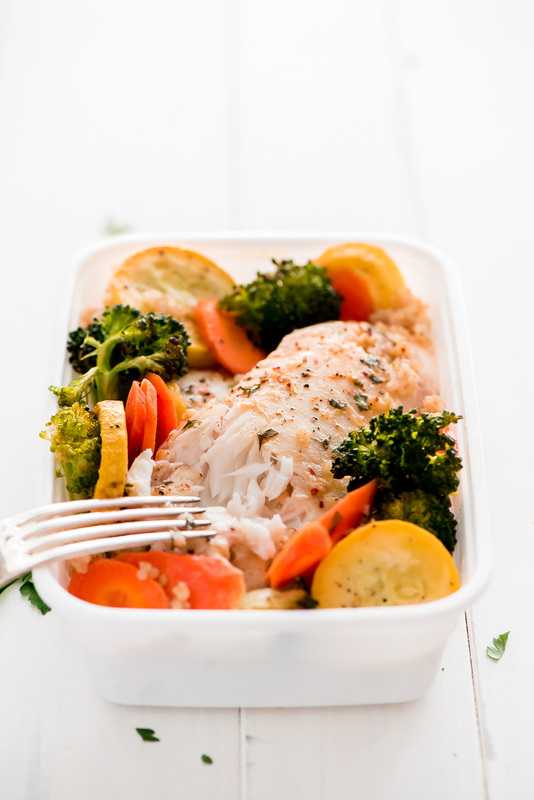 The veggies can be baked on the same pan as the tilapia as long as you cut them the proper thickness so that everything will finish cooking at the same time. Since carrots are firmer, they need to be cut thin. I like to use a mandolin which makes them all an even thickness. Squash or zucchini can be cut about 1/3 inch thick and broccoli florets should be cut into bite size one inch pieces. Since the Tilapia is well seasoned, all you need to apply to the veggies is a little bit of oil and salt and pepper. Mix all the veggies together with your hands until evenly coated. Spread them to the sides of the pan to make room for the fish. Tilapia is a pretty mild fish so applying flavorful seasonings is important. 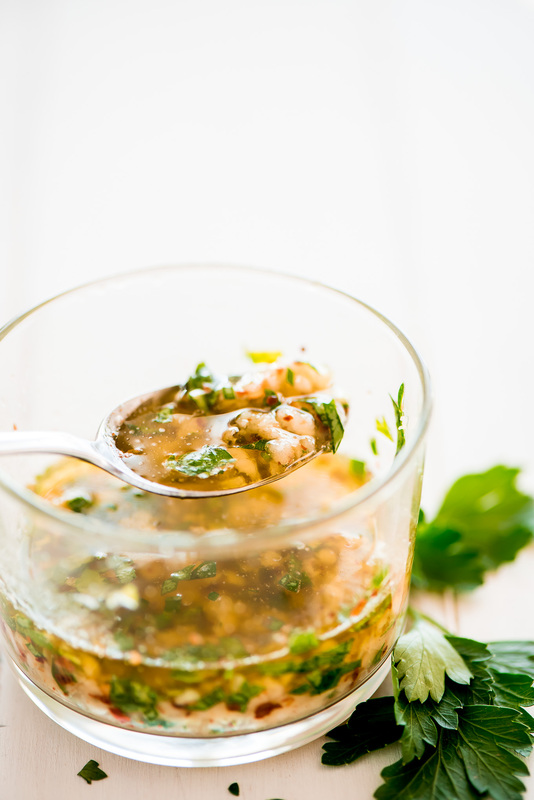 For this recipe you’ll make a tasty Italian marinade made up of oil, lemon or lime juice, spices, and fresh or dried herbs. Apply this to both sides of each fillet and then salt and pepper. 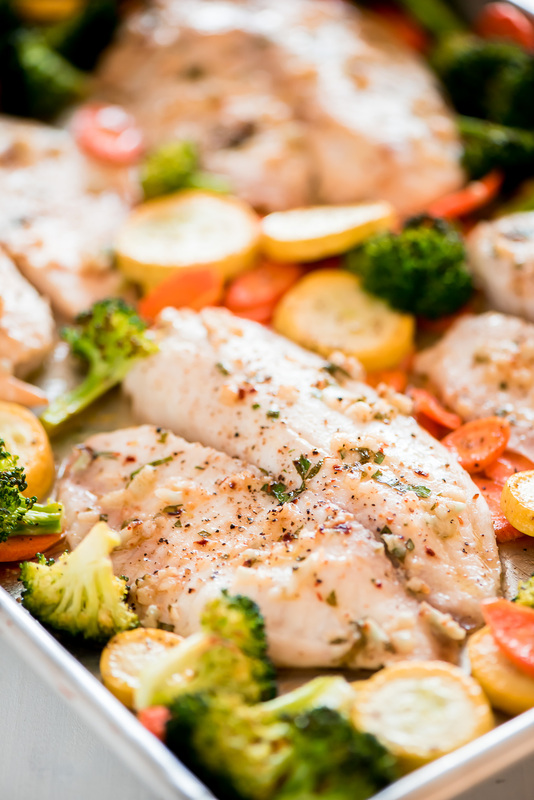 Place the tilapia on the pan and bake for 12-15 minutes or until the internal temperature is 145 degrees F and flakes easily but not dry. It should still be very moist. Serve this with rice (white or brown), quinoa or cous cous. This is such a great recipe to meal prep for lunches! 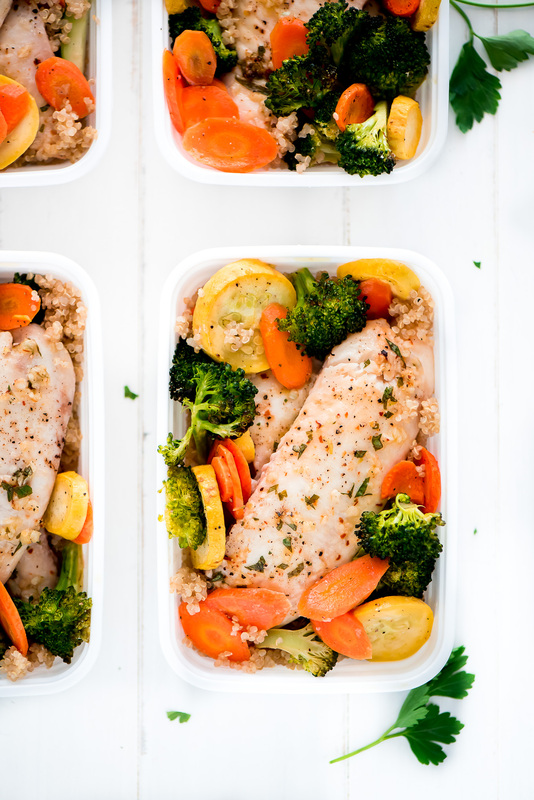 To prep, place quinoa, rice, or cous cous in the bottom of 4 microwave safe containers and then top with the tilapia and roasted vetables. Why meal prep? Having your meals prepped and ready to go makes getting ready for work or school much easier. Meal prepping is also a great way to save money (eating out everyday is expensive!) and stay healthy. Be prepared with nutrient dense food when hunger strikes! 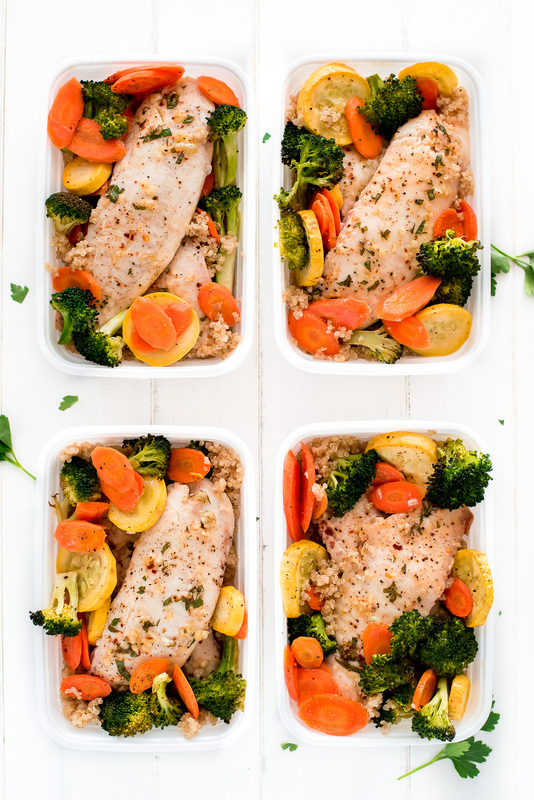 Get a healthy dinner on the table in less than 30 minutes with this easy Sheet Pan Baked Tilapia. This recipe is also great for meal prep! 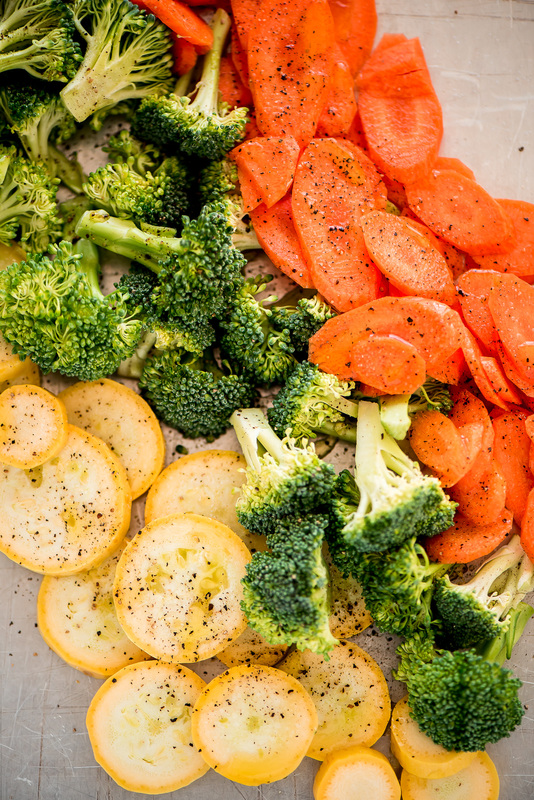 Place veggies on baking sheet and drizzle with 2 tablespoons olive oil. Sprinkle with salt and pepper, mix, and then push to the sides of the pan. In a small bowl, mix remaining 2 tablespoons olive oil, lemon juice, garlic, parsley, red pepper flakes, and onion powder together. Place tilapia on pan between the veggies and rub the marinade on all sides of the fillets. Sprinkle tilapia with salt and pepper. Bake for 12-15 minutes or until fish reaches 145 degrees F and flakes easily. Serve immediately.